HONG KONG and SINGAPORE, Mar 19, 2019 - (ACN Newswire) - TNG FinTech Group ("TNG"), Asia's leading Fintech company, has teamed up with Visa, the global leader in digital payments, to launch prepaid solutions in six target markets across Asia, in a move that will further expand digital payment services in a region where adoption of digital wallets is gaining traction. The two companies officially revealed their partnership during the world's leading Fintech event Money 20/20 Asia in Singapore. According to the World Bank, about 1.7 billion people in this world are unbanked(1) and in Southeast Asia alone it is estimated that only 27 percent of the population have banking accounts(2). Alex Kong, Founder and Chairman of TNG, said: "As a FinTech company focused on Asia, we are committed to empowering the unbanked in this part of the world. With the backing of Visa, which has more than 50 million point-of-sale locations globally, we are confident that this strategic partnership will benefit consumers as well as merchants and retailers in all target markets." As a participant of Visa Fintech Fast-Track Program, launched last year, TNG can tap into Visa's global network in as little as four weeks. The fast-track program provides a new commercial framework that includes access to Visa's payment capabilities, competitive fees and streamlined processes, tailored to Visa's fintech partners' needs. The program also links fintechs to platforms that are already certified by Visa and connects fintechs to sponsoring banks. Maaike Steinebach, Visa General Manager, Hong Kong and Macau said: "Our partnership with TNG, through the Visa Fintech Fast-Track Program, reinforces Visa's ongoing strategy of providing customers with the widest and best possible choices of payment solutions while accelerating the adoption of digital payments across the region. We hope to continue to collaborate with TNG to expand access to digital payments from Asia and beyond, enabling simple, fast and secure payments for more people through Visa's worldwide network and technology." Visa Inc. (NYSE: V) is the world's leader in digital payments. Our mission is to connect the world through the most innovative, reliable and secure payment network - enabling individuals, businesses and economies to thrive. Our advanced global processing network, VisaNet, provides secure and reliable payments around the world, and is capable of handling more than 65,000 transaction messages a second. The company's relentless focus on innovation is a catalyst for the rapid growth of connected commerce on any device, and a driving force behind the dream of a cashless future for everyone, everywhere. As the world moves from analog to digital, Visa is applying our brand, products, people, network and scale to reshape the future of commerce. For more information, visit About Visa, https://usa.visa.com/visa-everywhere/blog.html and @VisaNews. 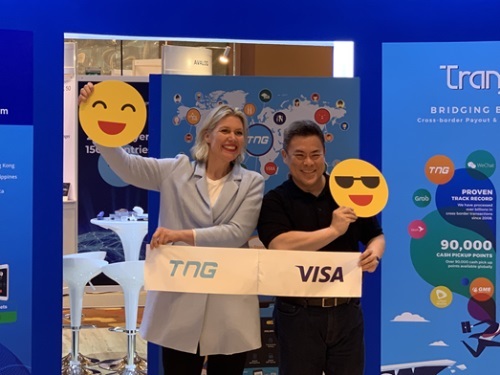 Alex Kong, Founder & Chairman of TNG (Right) and Maaike Steinebach, Visa General Manager (Hong Kong & Macau) attended the ribbon cutting ceremony to celebrate the launch of prepaid solutions in Asian markets. Alex Kong, Founder & Chairman of TNG (Right) and Maaike Steinebach, Visa General Manager (Hong Kong & Macau) attended the toasting ceremony, revealing the strategic partnership between TNG and Visa.